Here is the process I went through with The Judge. It started off as a lighter character but then I remembered that the Judge is pretty much the darkest individual in Firstborn. I apologize ahead of time for some poor pictures, most of these were taken from my phone. 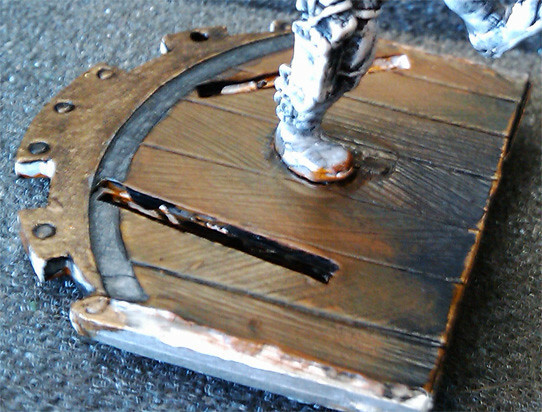 Here you can see I wanted to add a little bit of trim and the direction I was initially going with. These pics look fairly similar to the completed ones. I could have easily stopped here but I felt I could add a little more detail. I later had a random idea of adding black highlights to his knee pad and "bible" which you'll see in the final pictures This idea came after adding white trim to the shoulder pads and a black trim on the cowl. WOW!! Welcome to the boards, first things first. Now the painting. For some reason, we've had more people showing off great painting for our beloved games, and now you're in the mix. That Judge is as scary as the fluff. I've not seen a more menacing paint scheme on this model. The colors, shading, and highlights bring every facet into the character of the piece. Kings to you, and have some karma. 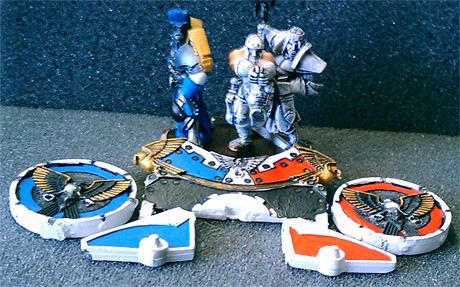 I've seen some great paint jobs on these forums which helped get me back into painting. It's been fun picking it up again. 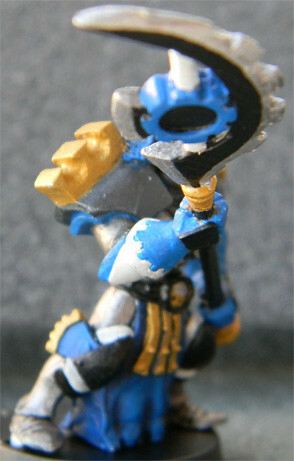 Here are a few poor pictures of the Repulsar Knight I'm working on. 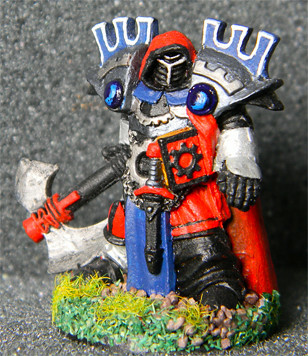 This is probably the quickest I've painted a mini. I didn't take many pics of the progress I've made but I'll try to snap some today. I'm aiming to complete it this weekend. 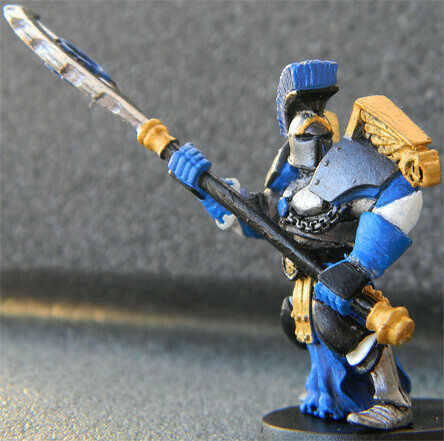 The first pic is to demonstrate the Regal Blue paint I'm using. It's quite dark and hard for my phone to pickup. 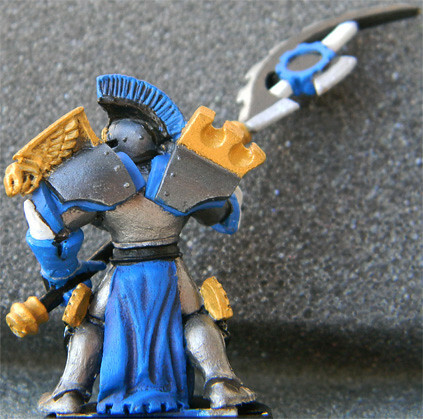 The last picture shows an Iron Guard I'm working on. This colour scheme seems to work well for Firstborn. Blue Steel can have great results! Welcome aboard Mass Distortion! Great to have you with us. Love the painting on the Judge. The colored knee pad was a twist from what I've seen in the past. I'm reserving future comments on him until you've fiinished basing him. 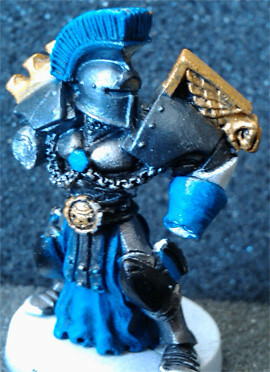 Nice touch on the Repulsar Knight's gold/black hem at the bottom...I think it would look good on the wrist cloth too. Can't wait to see how you finish the Iron guard. Here's some pics I took this morning of the Repulsar Knight. Since these were taken, I've changed the wrist cloth to black and I'll add a gold trim soon. 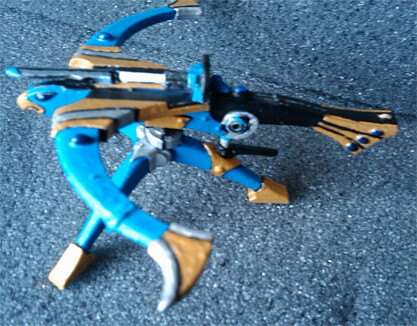 It does look better but now I'll need to make an adjustment to the hand guard. I'll probably try blue steel. 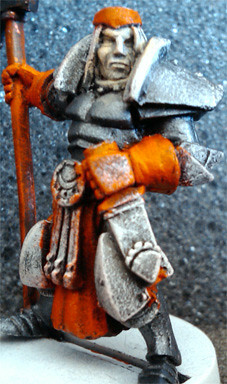 Here are some updates on the Firstborn Chariot I'm working on. 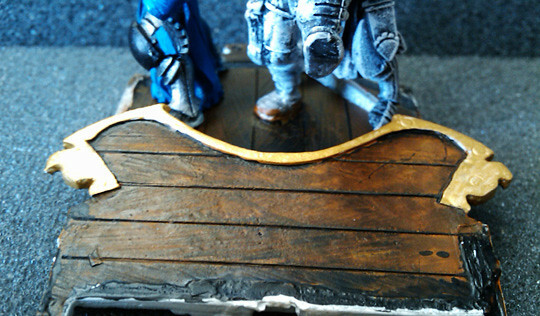 Here are some phone pics of the wood stain look I'm going for with the interior of the chariot. 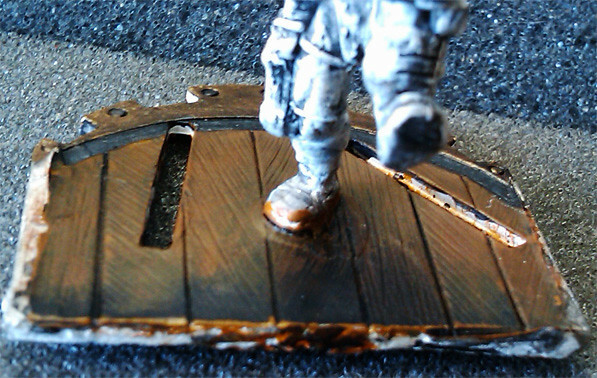 I've also tried to do some shading on the base. Here are a couple stages the Man At Arms went through. Here is an exterior view of the chariot. 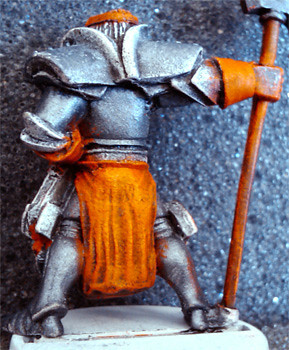 It demonstrates the colour scheme I'll be going with. 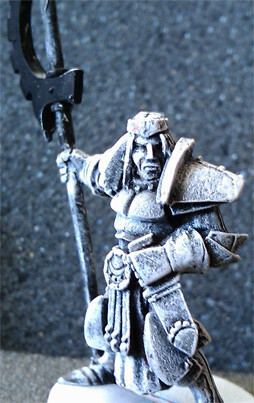 ...and of course a pic of the Judge completed, if you missed it in the Gallery. 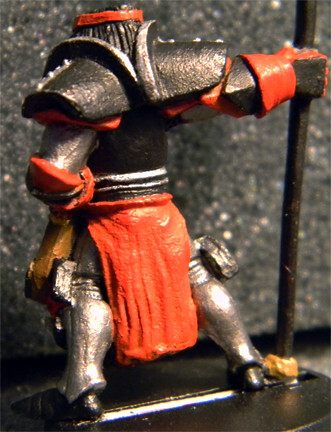 Here is the Man At Arms from the Firstborn Chariot. just want to chime in here and say these look great! I just started collecting firstborn myself...and when I get around to painting them in 2018, I'm going to look back at this thread for inspiration! I can't wait till my pile of Dwarf arrive! 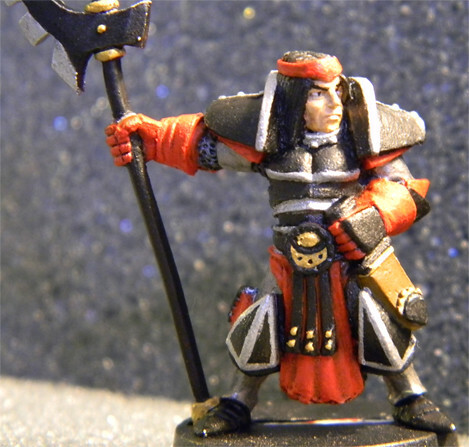 You have a pretty good amount of awesomely painted midgets in the gallery that will inspire me as well! Hello again, here is another update. 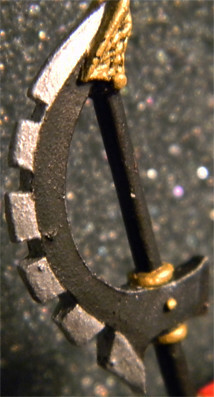 I'm nearing completion of the Firstborn Chariot. I need to complete the rider and 3 of the horses. Here is the Knight! I just need to touch up the adhesive marks on the wrists.